This beautiful Penguin Classics clothbound edition of Tolstoy's great novel is translated with an introduction and notes by Anthony Briggs, and with an afterword by Orlando Figes. At a glittering society party in St Petersburg in 1805, conversations are dominated by the prospect of war. Terror swiftly engulfs the country as Napoleon's army marches on Russia, and the lives of three young people are changed forever. The stories of quixotic Pierre, cynical Andrey and impetuous Natasha interweave with a huge cast, from aristocrats and peasants to soldiers and Napoleon himself. 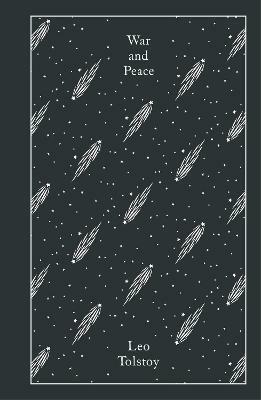 In War and Peace, Tolstoy entwines grand themes - conflict and love, birth and death, free will and faith - with unforgettable scenes of nineteenth-century Russia, to create a magnificent epic of human life in all its imperfection and grandeur. Anthony Briggs's superb translation combines stirring, accessible prose with fidelity to Tolstoy's original, while Orlando Figes's afterword discusses the novel's vast scope and depiction of Russian identity. This edition also contains appendices, notes, a list of prominent characters and maps. Leo Tolstoy was born in 1828 in the Tula province. He studied at the University of Kazan, then led a life of pleasure until 1851 when he joined an artillery regiment in the Caucasus. He established his reputation as a writer with The Sebastopol Sketches (1855-6). After a period in St Petersburg and abroad, he married, had thirteen children, managed his vast estates in the Volga Steppes and wrote War and Peace (1869) and Anna Karenina (1877). A Confession (1879-82) marked a spiritual crisis in his life, and in 1901 he was excommuincated by the Russian Holy Synod. He died in 1910, in the course of a dramatic flight from home, at the railway station of Astapovo.